Impress your family and friends with these fast, easy and delicious treats. 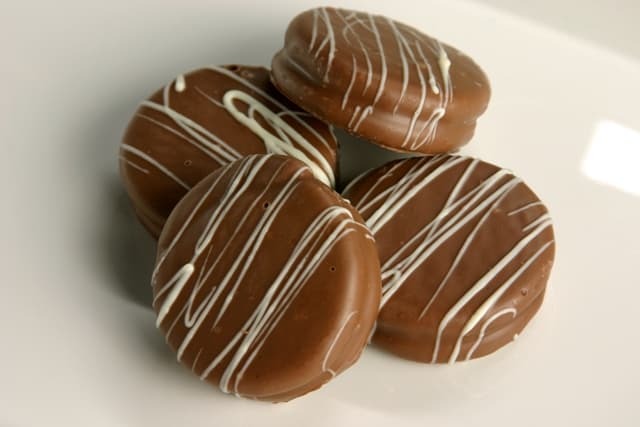 Chocolate Covered Oreo Cookies are beyond delicious. For some reason when I think of chocolate covered anything, I immediately think of Christmas time. In my family, during the holidays we cover or dip everything in chocolate. From almonds to raisins, we dip, drop, swirl and cover. My favorites are chocolate covered Oreo cookies and white chocolate covered pretzels rolled in crushed peppermint cookies. I’m also a huge fan of “bark.” I’ve decided to break the cycle of reserving chocolate dipping to just during the holiday season. I love Oreo cookies, my grandkids love Oreo cookies and I always have Oreo’s whenever they are here. Let the dipping begin! Dipping Oreo cookies or anything in melted chocolate for that matter, really is very easy and goes fast if your prepared and “set up” before you start. First, make sure you have everything you need…chocolate, sprinkles, wax paper, spoons, storage containers etc. before you begin. Another thing, buy enough good quality chocolate. It’s better to have too much than not enough. Second, have everything set up in an assembly line fashion. Start with one thing, such as nuts, and keep with it until completely finished. If need be, wash the double-boiler, rinse well and start melting more chocolate for the next batch, such as pretzels. Have sprinkles, chopped nuts or crushed candy ready for rolling into. Have drying racks set over wax paper to make clean up easy. *When drizzling in an opposite “color” of melted chocolate, see photo above, first chocolate needs to be cooled and firm. Third, I find that a double-boiler is the best way for melting chocolate and most importantly, keeping it the same temperature during the dipping process. A double-pan arrangement whereby two pots are formed to fit together, with one sitting partway inside the other. The lower pot is used to hold simmering water, which gently heats the mixture in the upper pot. *Double boilers are used to warm or cook heat-sensitive food such as custards, delicate sauces and chocolate. Dip Oreo cookies into melted chocolate. Place on wire rack, set over a sheet of waxed paper. Decorate with assorted sprinkles and drizzle with melted white chocolate. Store in an air tight containers. love dunking things in chocolate! Yum!